This post is a part of the Etsy Bloggers Street Team Blog Carnival. This week's topic is "collections". I'm a pack rat--or perhaps more appropriately a dragon. I horde just about everything. Interesting wrappers, old movie ticket stubs, bits of fabric, paper, and string. Or maybe the term I am looking for is "artist". : ) I often buy supplies because they call to me, knowing full well that it may be a decade before their project comes to me. So you can imagine how I get with things I actually, intentionally, collect. Magnets, picture frames, works of art. Luckily for me I have a penchant for tiny things and a love of controlled clutter so I tend to be able to display my collections as decor. But my favorite collection, the one other people know about, the one I have been adding to for years and years...is my dragon collection. Large ones, small ones, cute ones, and ones so ugly they are cute. I had this grand plan to lay out all my dragons together and take a group shot for this post, but many of my collectibles are still packed away. So, instead, I took a few shots of just a few of my friends. The dragon I am holding was purchased at a large art festival on my undergraduate campus. It was a massive event with thousands of people coming from wide distances to sell and buy. This little guy usually hangs from my wall mounted work lamp and twirls above my latest projects. The purple dragon seen in the upper right was a gift from my mother. Made of latex with a few wispy feathers for hair he is oddly cuddly in spite of himself. Just below him is one of FOUR identical figurines that were all gifted to me at different times. I have three in green and one in blue. And finally, the last image is a button I drew as a senior in high school and shows the beginnings of my dragonlings, although I didn't realize it at the time. And of course, one of the best parts of collections is adding to them! 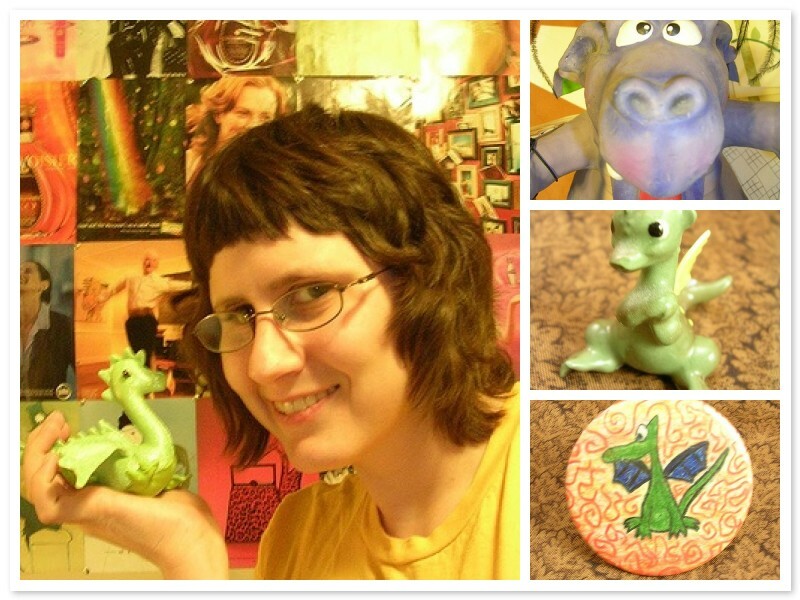 Which is why my favorites on etsy hold all sorts of dragons in every shape, size, and price range. Some of my faves are shown below. 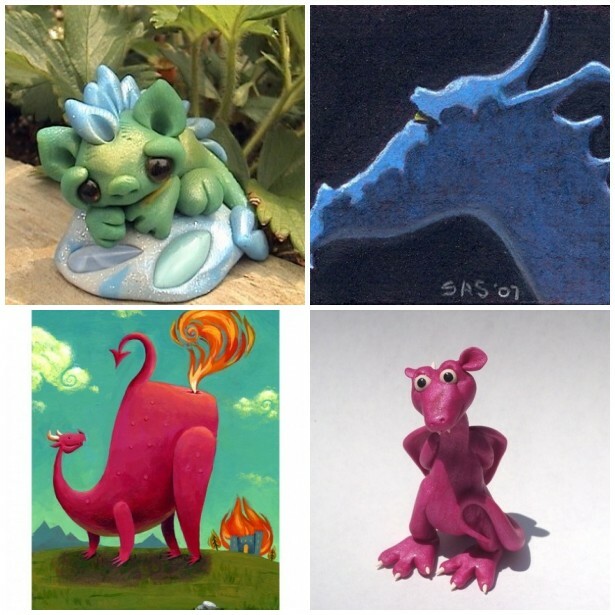 I love your dragons! They are so darn cute. Great job with the carnival - thanks for hosting!